Kristin Hjellegjerde Gallery, London and Gallery 1957, Accra are pleased to announce an exciting collaboration in February 2019, presenting new works from Gerald Chukwuma which marks the artist’s first solo show in the UK. Gerald Chukwuma is one of Nigeria’s fastest rising contemporary artists, noted for his intricately crafted wood-slate sculptures. Using a multitude of techniques, his unique approach to burning, chiselling, and painting commonly found materials captures a richly layered history imbedded with personal and political meaning. In his work spanning painting, sculpture and collage, Chukwuma explores migration as a constant process of transformation and reinvention. The use of traditional Uli and Nsibidi symbols links his work to the Nsukka art tradition – a movement which emerged in the 1970s from the University of Nigeria and worked to expand and modernise the aesthetic of Igbo culture. In this new body of work Chukwuma explores the important, historical Igbo Landing site at Dunbar Creek on St. Simons Island, Glynn County, Georgia where one of the largest mass suicides of enslaved people took place in 1803. Travelling to the Georgian coast, Igbo captives from what is now Nigeria, took control of their slave ship and committed mass suicide as a resistance towards slavery. During his research, Chukwuma was surprised to find little information on the topic in books or on the internet, which lead him to search for verbal histories passed down through families and generations. 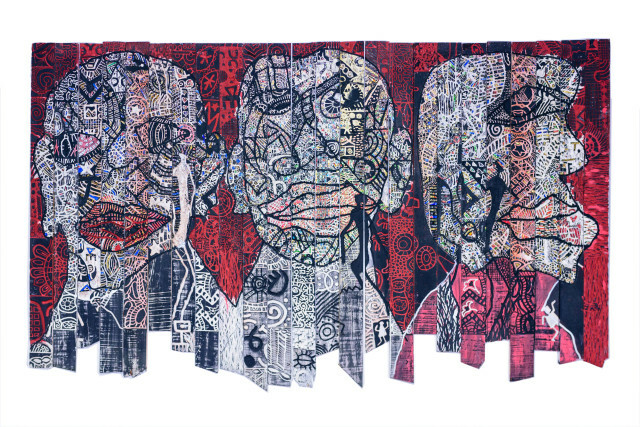 During these retellings, Chukwuma became fascinated by the wrinkles on the faces of the elderly storytellers, which is the inspiration for these works.